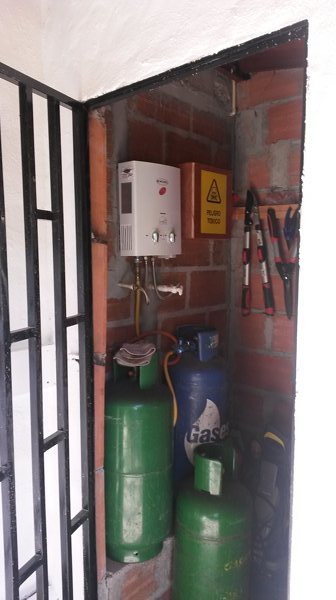 An Englishman in Colombia: Multilingual Poisons Cabinet!! Although I have both the new window and the Reja / Security bars, ready to install, it is on hold for a few days, for various reasons, the weather being one, one minute it is hot summer, the next torrential rain, also we are having problems again with the Chery Tiggo, it had a new clutch pump in October, and it now needs another, the Manager tried to tell us today that because it is front wheel drive, it doesn't like mountains!!!!!!!!! Sorry but why have them in a country full of mountains then, send them to Holland where it is flat, Numpty! I think the car will have to go, and we will look for a second hand one, I should have listened to my younger Brother in the first place. 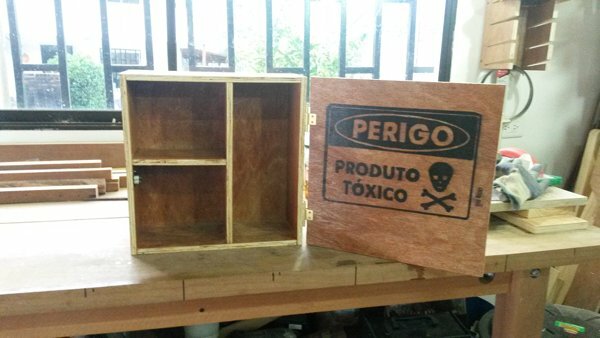 Anyway, there are other things that need doing, and one of those was building a poisons cabinet, so that my four legged friends and inquisitive nephews don't come into contact with the poisons I have for pest control. Yesterday, I ripped some 1/2" plywood into 5" strips, and two 13" square panels, for the back and the door, and threw it together with some glue and brad nails, I had to get the hinges and catch today. 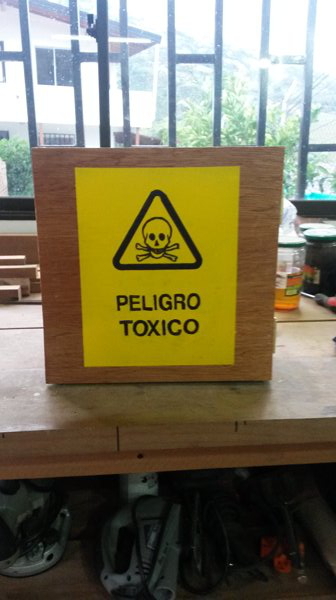 Instead of leaving it as a box and hanging it on the wall, I decided to give it a better finish, so nipped up to the computer, asked for a poisons sign in Spanish, picked one that looked good, printed it off, and transferred it to the 'door', spruced up the artwork with a black marker, then varnished it, this photo was taken today, the original has been binned. You won't believe this, but it wasn't until I took a photo of it last night, that I realised it is in Portuguese, the air was blue. As a result I shut up shop for the night. This morning it was back into the Shop, and rather than cut another door, I decided I might get a Brasilian visit me one day, so I painted a yellow panel on the other side, and then copied a 'Spanish' warning onto that, again sprucing up the artwork with a marker, and then spraying it with lacquer. Whilst out today, I bought the hinges and latch, fitted them, it is now ready to go onto the tool store wall in the morning! Just to prove that it is not just sitting on my workbench!